Metcroc farm is full of slow moving product that doesn’t bite….hard. Juvenile crocs rest by a large pool in a kind of hyper-alert somnolence. 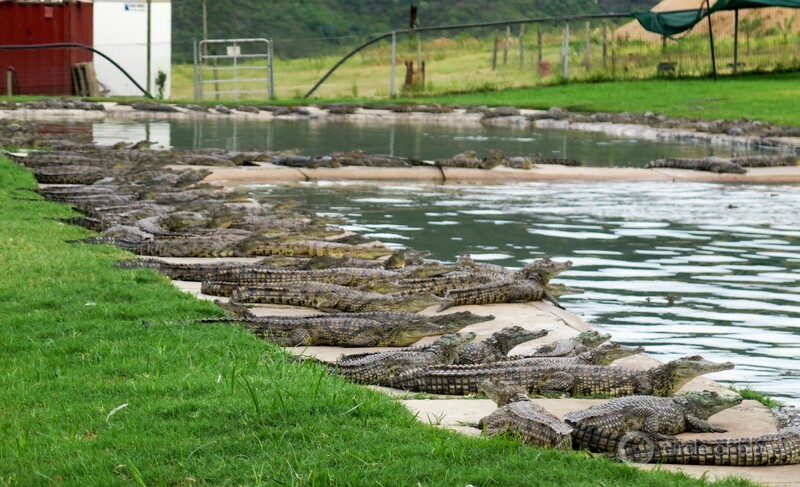 Metcroc is one of the dozen or so croc farms that produce the bulk of the 45,000 skins that the United Nations estimates are exported annually from South Africa. PONGOLA, South Africa — Back in the early years of the century, when the kids were school age, and before the Metcroc farm elevated to international relevance as a primary source of skins for $US 40,000 Jackie Soft Gucci handbags, Elza Labuschagne summoned adult crocodiles to her side with the cluck of her tongue and a kind of throated, deep melodic hum. The adult females and males, some five meters long (16 feet), reacted to the familiar signal and lumbered to her, forming a half circle of pointed snouts opened to rows of fearsome teeth. Elza’s regular practice was to sit on the ground, carve chunks of flesh from a slaughtered goat alongside, and hand feed the crocs, one by one. Occasionally she would let one of the big reptiles lay their head in her lap. When friends demand empirical evidence of her tale of crocodile love, the color pictures in a family photo album confirm exactly what she says. In one photograph a younger Elza, secure in her post at the center of a crocodile circle, looks as relaxed as if she were in a warm bath. There is nothing that informal about the Metcroc farm in 2016. Elza’s 56-year-old husband Coen Labuschagne and their two adult children, son Coen Jr. and daughter Corle’, manage a crocodilian husbandry showcase of production and efficiency. Metcroc farm, founded in 1997, is not only one of South Africa’s largest producers of crocodile skins, it also is considered a global leader in skin quality. The story of Metcroc’s development is by no means a straight line from start to success. Global market downturns affect demand for luxury item sales and there have been several lean periods in 19 years. A former partner tried to seize the operation in an unfriendly takeover that prompted years of lawsuits, crushing legal bills, and stress. Learning crocodile care and feeding, markets, and production efficiency took years. Photo © Keith Schneider / Circle of Blue Corle’ Labuschagne, who is intent on croc farming as a career, found that stimulating newborns with the bright light of a laser pen wiggling next to balls of ground meat prodded them to eat. “You can’t open a book and just start a crocodile farm,” says Coen Labuschagne. Now, a period of deep drought in KwaZulu-Natal province is cutting Metcroc’s water supply for its two neighboring crocodile production facilities. Meijershoek, the older of the two, is where adults breed, eggs are hatched, and babies are raised until they are juvenile. Nearby is Grootdraai, a larger and newer feeding facility, where juveniles are pampered in large ponds surrounded with aprons of cut grass. In a typical wet year Metcroc uses 543,000 cubic meters of water (143 million gallons) supplied from the Bivan Dam. More than a year of deep drought has dropped the dam’s reserves 90 percent, which cut Metcroc’s water allotment 75 percent. With just 136,000 cubic meters available annually, or the equivalent of 372 cubic meters a day (98,000 gallons), Labuschagne cannot regularly cycle fresh water through the pens and ponds. He worries that a small increase in the number of unfertilized crocodile eggs, Metcroc’s primary route to fiscal success, is linked to water scarcity. Crocodylus niloticus, the Nile crocodile, has nested in the nearby Pongola River, and roamed much of South Africa for 240 million years. One of 23 crocodilian species globally, the Nile croc has been raised commercially in South Africa, and neighboring Mozambique and Zimbabwe, since the mid-1970s. Before that wild crocodiles were hunted mercilessly for their skins until 1975, when the conservation directives of the 1973 Convention on International Trade in Endangered Species outlawed global trade, except from captive breeding farms. Peter Chamgwera, a 42-year-old farmworker, and Metcroc employee since 2011, feeds rolled balls of meat and meal to baby crocs cared for in long open pens. The South Africa Crocodile Farmers Association counts 60 commercial croc farms, though most are small and earn part of their keep by attracting tourists. Metcroc is one of the dozen or so croc farms that produce the bulk of the 45,000 skins that the United Nations estimates are exported annually from South Africa. Coen and Elza Labuschagne figured out how to update water supply and purity, reptile caretaking, slaughtering, processing, and marketing to turn the white belly skins of two and three-year-old crocodiles into some of the world’s most expensive human wardrobe accessories. From the controlled temperature egg-hatching incubator, to the sandy nesting pens for mothers, to the big ponds for three-year-olds heading to slaughter, Metcroc is an industry innovator. Corle’ Labuschagne, who is 30 and intent on croc farming as a career, found that stimulating newborns with the bright light of a laser pen wiggling next to balls of ground meat prodded them to eat. Under a long-term contract with GNP Pelli, the Milan-based tannery that supplies the finished crocodile leather for Gucci and Prada handbags, some 10,000 skins are processed, salt-preserved, and shipped to Europe annually by Metcroc. Each sells for approximately $US 250. Metcroc employs 80 people to care for crocodiles, some of which will live for more than eight decades. Just hatched crocodiles at Metcroc farm in Pongola. Metcroc is one of South Africa’s largest producers of crocodile skins. It also is considered a global leader in skin quality. The son of a farmer with years of animal husbandry experience caring for livestock, Coen Labuschagne got interested in crocodile farming as a young man. He asked for help from a croc farmer in Limpopo province, north of Johannesburg. “I was farming small-scale chickens and sheep,” he said. “Farming is my life. I phoned this croc farmer and asked him, ‘Can I come and see your crocodile farm?’ He said yes. “I was amazed at what I saw there. It fascinated me. I saw how to farm intensively with an ancient animal in this modern era. I didn’t mind what the running cost would be. Just to farm an ancient animal was the challenge for me. I decided that Pongola is the right place. Crocodiles are naturally in the environment here. At least part of the genius of a successful crocodile farm is to coax a powerful and potentially lethal prehistoric animal to behave like a sleepy puppy. To some extent, caring and feeding crocodiles at almost any age is like meandering across slippery rocks. Balance. Courage. An endless measure of respect for circumstances that can get unsettled in an instance are requirements of the job. Coen Labuschagne and his wife, Elza Labuschagne, figured out how to update water supply and purity, reptile caretaking, slaughtering, processing, and marketing to turn the white belly skins of two and three-year-old crocodiles into some of the world’s most expensive human wardrobe accessories. None of this is readily visible in the palm-shaded pens and concrete ponds where thousands of Metcroc’s charges, ranging in age from newly hatched to long-snouted brutes, lounge in a kind of hyper-alert somnolence. Mothers lay motionless in the sand, covering the 25 to 40 eggs they laid in October. Males rise up on short legs, move a meter or two, and settle in a new spot. Juveniles lie side by side on the deck of dark ponds. The scent of crocodiles, not inviting, is sort of like a shirt saturated with old olive oil tossed on a pile of smoky red coals. The only sounds are occasional bellows and tails hitting the ground as one adult lumbers into another’s space. Still, the apparently settled scene suggesting crocodilian satisfaction can turn into an instantaneous contradiction of menace and aggression. Labuschagne notes that every crocodile at Metcroc has interacted with people their entire lives so they tend to be more comfortable when handled. He trained staff members to move fluidly, and carefully, to keep animals calm. Juveniles are handled with some regularity, but the bites, he assures, are mere nips. Many of the farm’s caretakers have been with Metcroc for a decade or more. Over the next decade, as production increases to 20,000 skins annually, staffing requirements also will increase, he says. In a nation with unemployment rates exceeding 35 percent, those new jobs will help. Elza, though, no longer feeds crocodiles gathered in a circle. “There’s too many to call by name now,” she says. Grootdraai, draped by Pongola’s magnificent ridges, is the larger and newer of two captive Metcroc facilities, where juveniles are pampered in large ponds surrounded with aprons of cut grass. More than a year of deep drought has dropped Metcroc’s water supply 75 percent.